While the story of self-made Texas oil entrepreneur H. L. Hunt is well known, Burst ( The Management Game ) focuses this lively family history not only on the effects of huge material inheritance on his 14 heirs (from a legal marriage and two secret menages) but makes a debatable assertion that Hunt Sr.'s negative psychological legacy of divided affections, frequent absences and gambling instincts caused identity problems for his sons and were at the root of their financial debacles. Burst recounts the often-risky business ventures of the original heirs and the careers of other family members, several of whom joined Hunt Oil. At H. L. Hunt's death, one of his sons by a mistress, Ray, gained control of the company, splitting the empire into two family groups in 1977. Despite bankruptcy forced upon Bunker and Herbert Hunt by their disastrous attempt to corner the world silver market, this appears to be a family of true survivors, or, as Helen Hunt observes here: "Dad would be proud of his kids." Photos not seen by PW. Burst, a writer with a Harvard M.B.A., presents a chronology of a family legacy that spans almost 100 years. Entrepreneur Haroldson Lafayette Hunt Jr., born in 1889, first became involved in the world of oil and gas exploitation in 1921 with $50 and a gambler's instinct. His old-fashioned rugged individualism and shrewd real estate trading practices in the 1920s and 1930s laid the foundation for the billionaire's dynasty. 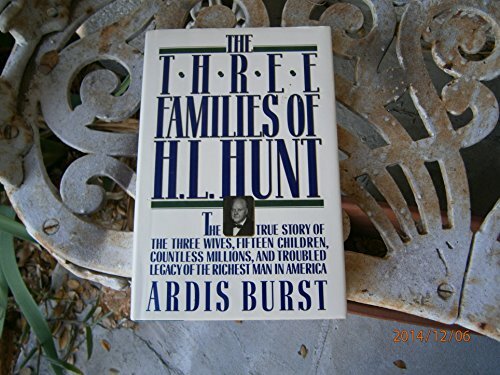 Burst writes not only a history of the Hunt Oil Company and the diversified HLH Products but also of the three women who bore Hunt's 15 children. He also discusses his children's lives, accomplishments, and business dealings. Burst relied mainly on secondary sources. In spite of that, this contemporary biography will be popular.Mary Ann Wasick, West Allis P.L., Wis.